Aims: To establish whether the incorrect use of bouncy chairs (BC) and car seats (CS) is a significant cause of injuries in babies. Methods: Prospective study over a 12 month period. All babies under the age of 1 year, presenting to the department with a head injury were eligible. Results: A total of 131 cases were recorded, 17 (13%) of which were associated with either BC or CS, the second largest aetiological group. All BC cases (11/11, 100%) were caused by a fall from a surface with the baby in the chair. In the CS group, 2/6 (33%) were caused by such a fall. The carer was aware in only one of the 13 cases involving a fall from a surface that there was any chance of injury from this mechanism. Conclusion: Falls from inappropriately placed bouncy chairs or car seats form a significant proportion of head injuries in infants, resulting in unnecessary and preventable morbidity. A Medline search at the time of our study showed there was no evidence that pointed to potential risks of bouncy chairs (BC) and car seats (CS) in the home setting. These devices are commonly employed on worktop surfaces such as a kitchen table, where the infant can be watched closely at eye level. It was our impression that many babies were presenting to the paediatric accident and emergency (A&E) department having sustained a fall while still in the chair. Although such chairs carry a warning at the point of sale that they should never be placed on an elevated surface, carers often reported that they did not realise this. We therefore undertook a study designed to look at all head injuries in infants in general, and those resulting from the incorrect use of BC and CS in particular. 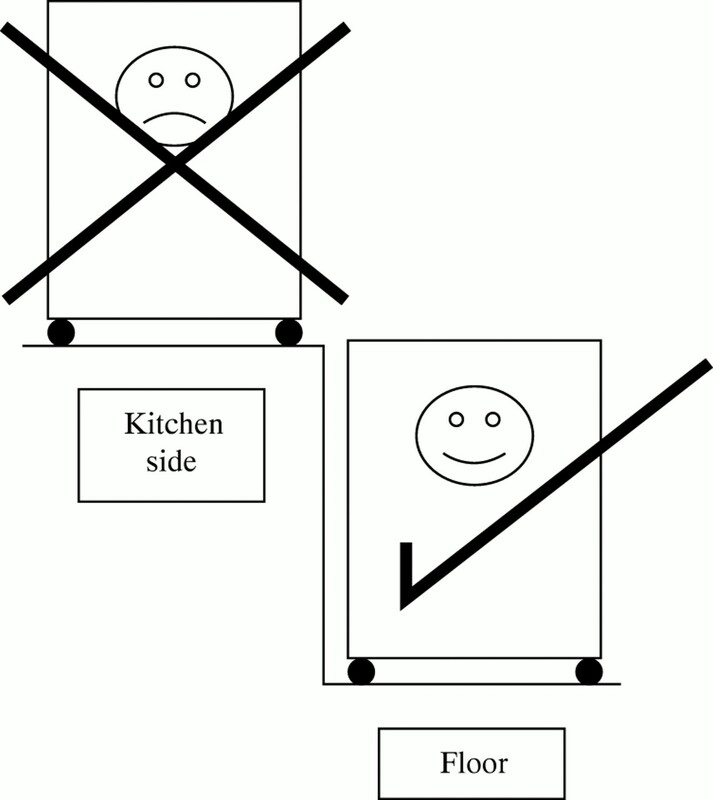 Figure 1 shows two of the most common types of bouncy chair. 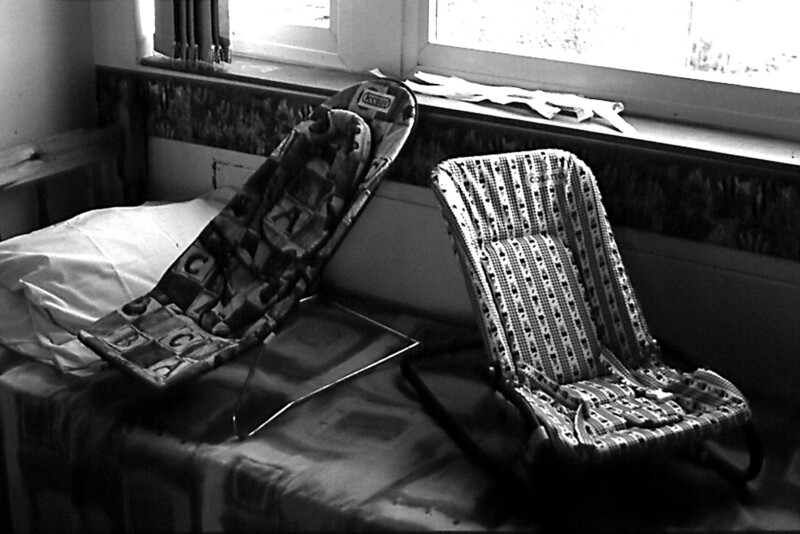 Two of the most common types of bouncy chair. A prospective observational study was undertaken, including all patients under the age of 12 months, presenting with a head injury to our A&E department from 1 January 1996 to 31 December 1996. We designed a proforma to be used as the actual notes for the patient, which allowed for details of the history and examination findings to be clearly documented. Each carer was asked directly if they were aware that BC and CS might not be safe if placed on elevated surfaces. At the end of every week the A&E computer triage information was reviewed to ensure that no cases were overlooked. The data were collected at the end of the year, scanned into the SPSS statistics package, and analysed. A total of 131 cases were recorded over the one year period: 71 (54%) were boys and 60 (46%) girls; mean age was 6.9 months. Figure 2 shows the range of mechanism of injury. The most common was a fall from a surface (52/131; 39.7%); in particular, 23/52 (44.2%) fell from a bed. The mechanism of injury resulting in a head injury and subsequent attendance at A&E. Injuries in 17 cases (13% of the total) were associated with either BC or CS, 13 of which were caused by a fall from a raised surface with the baby in the chair. In those involving a BC, 11/11 (100%) were caused by such a fall. In the CS group, 2/6 (33%) were caused by such a fall; the rest in the CS group were a result of having been dropped in the seat while being moved from car to house. Table 1 summarises various outcomes when the study population is divided into the BC/CS group and the non-BC/CS group. The majority of the BC/CS group (85%) fell onto a hard surface (stone, brick, tiles, linoleum, or wood) compared to 56% in the rest of the study population; here carpet was the most common surface. This difference reached significance (p = 0.046). Despite this babies in the BC/CS group were no more likely to suffer a skull fracture than the non-BC/CS population. A total of 114 babies underwent a skull x ray examination (the department policy at the time was to perform x ray examinations of head injuries in all children under the age of 1 year). There was no significant difference between the two groups in relation to whether the baby had a skull x ray examination, was admitted to hospital, or showed any neurological signs or symptoms (the most common being drowsiness). Only one carer admitted to being aware that BC and CS were not safe if placed on elevated surfaces. It is not surprising that in the BC/CS group there was an increased risk of falling onto a hard surface given the common siting of the chairs in the kitchen, but no significant increase in risk of skull fracture was found in this small study population. Despite the fact that all such chairs are supplied with warnings against such use, carers seem to remain ignorant of the risk. However, this must be viewed with caution, as there is likely to have been reluctance to admit to having been aware given the subsequent injury. Since our study new data have been published on these risks in the USA8; this study reviewed electronic reporting of injuries in those less than 6 months of age in 1997, and estimated some 8700 infants were treated in the emergency department as a result of a fall while in a car seat or baby bouncer. Over one third of cases were directly attributed to these devices being placed on an elevated surface at home. We suggest that the manufacturer warnings are insufficient. One of our criticisms is that the warning is usually in word form; a pictorial representation such as in fig 3 may prove more effective. We also suggest that health care promotion should include reference to this potential mechanism of injury; this could be in the form of an entry in the parent's held record and subsequent discussion with the health visitor. Suggested pictorial warning of the dangers of placing these devices on an elevated surface. Friedrich MJ. Report documents causes of child death. JAMA1999;282:1903. Partington MD, Swanson JA, Meyer FB. Head injury and the use of baby walkers: a continuing problem. Ann Emerg Med1991;20:652–4. Mayr J, Gaisl M, Purtscher K, et al. Baby walkers—an underestimated hazard for our children? Eur J Pediatr1994;153:531–4. Gleadhill DNS, Robson WJ, Cudmore RE, Turnock RR. Baby walkers ... time to take a stand? Arch Dis Child1987;62:491–4. Louis E, Fazen III, Felizberto PI. Baby walker injuries. Pediatrics1982;70:106–9. Claydon SM. Fatal extradural hemorrage following a fall from a baby bouncer. Pediatr Emerg Care1996;12:432–4. Lee ACW, Fong D. Epidural haematoma and stroller-associated injury. J Pediatr Child Health1997:33:446–7. 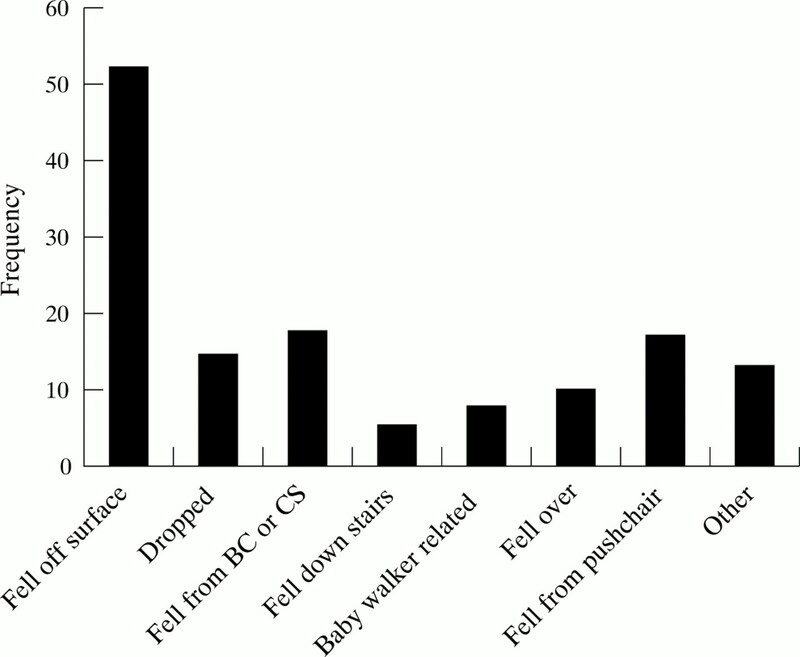 Pollack-Nelson C. Fall and suffocation injuries associated with in-home use of car seats and baby carriers. Pediatr Emerg Care2000;16:77–9. Kendrick D, Marsh P. Baby walkers: prevalence of use and relationship with other safety practices. Inj Prev1998;4:295–8.